Tropical Storm Bertha could help alleviate Caribbean drought. 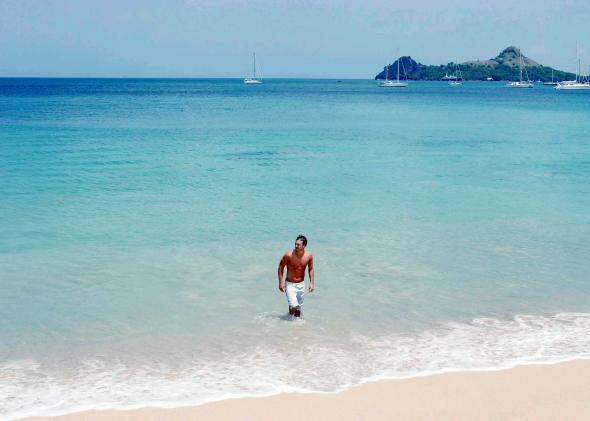 Beautiful Saint Lucia in the West Indies is suffering from a drought. For the past several months, drought has been building across the Caribbean. That’s put a damper on the regional economy—from Colombia to Saint Lucia to Haiti—and led to intensifying problems for many island nations that rely on regular rains to replenish reservoirs. In Puerto Rico, water rationing is set to begin next week for about 300,000 residents of San Juan, as two reservoirs have dropped to dangerously low levels. In Jamaica, while farmers fretted this week over vegetable shortages, Derrick Kellier, the nation’s acting minister of agriculture and fisheries, tried to downplay the situation. “Fortuitously, this happens to coincide with the low demand period in the hotel industry, which is a major consumer of these products,” he said during a Tuesday press conference. According to National Oceanic and Atmospheric Administration data, parts of the region just experienced the driest June on record. 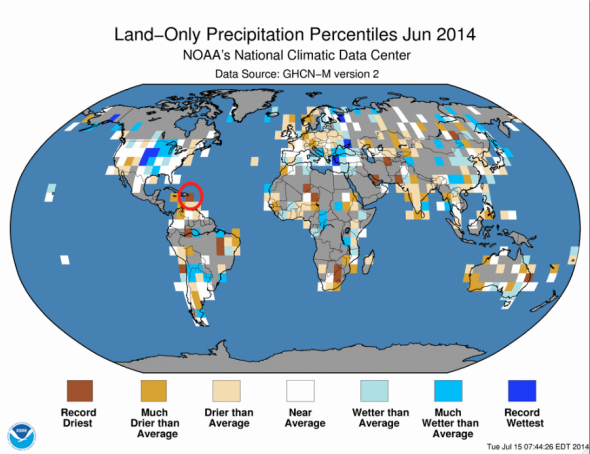 Part of the northeast Caribbean (circled) had the driest June since records began in 1880. Most Caribbean economies are closely tied to the tourist trade, and hurricane season is traditionally the time when the influx of beachgoers slows. So while the tourists are at home, folks in the Caribbean are welcoming a deluge. As Atlantic hurricane season enters its peak August-to-October phase, the best bet for relief at this point is a direct hit by a tropical storm or hurricane. Van Meerbeeck is referring to is Tropical Storm Bertha, a wimpy little system currently headed toward the islands. Problem is, thunderstorm activity in this particular storm is scant, suppressed by dry air and dust with origins in the Sahara Desert. A similar storm earlier this month fizzled on approach to the Caribbean, barely reaching tropical depression status. As of Friday morning, the National Hurricane Center expects Bertha to produce rains of only 1 to 3 inches on its passage through the Caribbean this weekend. Dry air and Saharan dust surround Tropical Storm Bertha. On some islands, 25 to 65 percent of annual rainfall comes from tropical storms and hurricanes. But probably not this year. Drought will likely worsen in the Caribbean, according to an outlook from Columbia University’s International Research Institute for Climate and Society. On Thursday, researchers at Colorado State University released an updated outlook (PDF) for the remainder of hurricane season, noting that the chances of a hurricane tracking through the Caribbean this year are about one-third less than normal. The researchers said Atlantic is “especially detrimental for hurricane formation” this year, owing to a weak El Niño, cooler-than-normal ocean temperatures, and higher-than-average air pressure and wind shear. That means drought is likely to continue or worsen in the Caribbean, despite this being typically the wettest part of the year. But what about the destruction a hurricane might cause? You know, flooding, mudslides, and the like? Well, increasingly, the Caribbean has that part covered. An innovative risk-pooling scheme called the Caribbean Catastrophe Risk Insurance Facility has recently secured a $30 million catastrophe bond from the World Bank, the first one it’s ever issued specifically for hurricane risk. The idea is being held up as a possible model for climate change adaptation, with African and Central American countries already coming on board. Due to its focus on risk transfer, it may even play a central role in the debate over who bears the burden for the increasingly sticky negotiating point in global climate talks over rich country obligations for “loss and damage” due to disasters in poorer countries worldwide. Three storms have triggered successful payouts since the program’s launch in 2007. Earlier this year, CCRIF expanded a parallel effort to address disaster risk to subsistence households that now covers Jamaica, Saint Lucia, and Grenada.